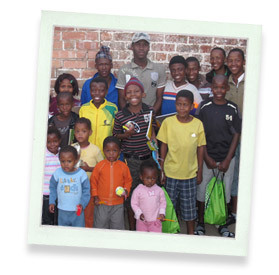 I stumbled onto the Pack for a Purpose website when my husband and I were preparing to travel to South Africa for a vacation in May 2011. Although we didn’t connect with a specific organization , Pack for Purpose gave me great ideas on what and how to pack. My husband and I took 4 large suitcases full of donations. We visited both of the Bophelo Orphanages in Kimberly, South Africa as well as a local staff village at Fort Richmond Safaris. We were able to donate much needed supplies to the children/staff/families. We also had a suitcase full of school supplies and Fort Richmond Safaris assisted us in delivering the items to the local farm school. What an amazing experience! We will never forget the children and people of Africa. SO, needless to say when we planned a big group vacation for March of 2012, to Jamaica, I was back on the Pack for a Purpose web site. Our group (20 people total) had booked a 7 day stay at Couples Negril. I contacted the founder of Pack for a Purpose and asked how I could donate supplies to a Sandals foundation when we were staying at Couples. Rebecca quickly got me in touch with the Sandals Foundation and we chatted over e-mail as to what to bring and how they would come to Couples to retrieve the donations. Our whole group gathered supplies, we even had 2 laptops donated! Once we got to our resort, I called Kendra and Jervene from the Sandals Foundation and they arranged to come to Couples and pick up the donations. When the ladies arrived they were so lovely and thankful! They explained the Sandals Foundation in detail and they had thank you cards and pins for our group! They took pictures and will include them in the Sandals Foundation newsletter. Needless to say, I will Pack for a Purpose whenever I travel!!! !